Color, shape, material, fit and more all matter when shopping for eyeglass frames. Choosing frames can be overwhelming, but these five tips will make the process of finding great-looking glasses much easier. 1. Choose frames that complement your face shape, features and coloring. If your face is angular or square, round and oval frames look best. The opposite also is true: if your face is round or oval, you’ll look good in square and angular frames. Also, if the top of your face is wider than the bottom (heart-shaped), select a frame with a dramatic (wider, heavier, etc.) bottom edge to balance your facial features. Conversely, if your face is wider on the bottom, choose a frame with a dramatic top edge. The frame’s bridge can affect how your eyes and nose look. A thin or clear bridge gives the illusion of width to close-set eyes, while a colored one will make wide-set eyes appear closer together. A low bridge will make your nose appear shorter. The frame color should complement your coloring, including skin tone (warm or cool), skin color (ranging from fair to dark) and hair color. It can be kind of hard to tell which skin tone you have; warm skin has a golden yellow tint, while cool skin has either blue or pink. Still not sure? Take a look at the veins in your wrists and feet: if they seem mostly greenish, you have warm skin, while mostly blue veins mean you have cool skin. Frame colors that look nice with warm skin include brown, most metals and splashy colors like turquoise. Colors that complement cool tones include gray, silver and muted colors. The colors of your skin and hair play roles as well. Those who are light in coloring (ivory skin and blond hair, for example) look nice with faint-colored frames. Those with medium coloring (olive skin and brown hair, for example) look nice with light-colored metals and browns. Those with dark coloring (chocolate skin and black hair, for example) look nice with most metallic frames. What if your coloring is kind of mixed, like fair skin and medium-brown hair? Try frames that match each coloring to see which suits you better. Can’t trust your own judgment? Absolutely bring a friend along to help you decide. 2. Pick frames that are not too big, not too small. If you choose a frame that is too large, visual distortion and glare can occur. If your frame is too small, you limit your peripheral vision. Generally, the frames shouldn’t be wider than the widest part of your face, with the exception of frames for oval faces, which can be a little wider. When you put on a pair of glasses, your eyes should look out of the center of each lens. The frames should not be so tight that they pinch your nose or leave red marks. Conversely, they should not be so loose that they slide down your nose. If they have nose pads, an eye care professional can easily adjust them. The top of the frames should not be above your eyebrow line, and the bottom shouldn’t touch your cheeks. And they should be comfortable around your ears. If your frames become uncomfortable over time, bring them back to your eye care professional. Usually readjustments are free. Never try to adjust frames yourself! 3. Choose eyeglass frames that match your lifestyle. Maybe you won’t want that ultra-funky pair if you’re really funky only on Saturday night and you’re getting just one pair of glasses. Chances are, you’ll probably also need to wear them to school, religious services, Grandma’s house and more. You know what your style is: dressy, jeans and T-shirts, bohemian, whatever. Choose something that matches most of your moods. 4. Don’t let your lenses be distracting. Reflections in your lenses can distract from the appearance of your glasses, interfere with your vision, and make it difficult for others to see the expressiveness of your eyes. Whatever frames you choose, make sure your eyeglass lenses include anti-reflective coating for the best vision, comfort and appearance. 5. Weigh the value of frame materials and other features. Generally you can choose frames in plastic, metal or a combination of both. 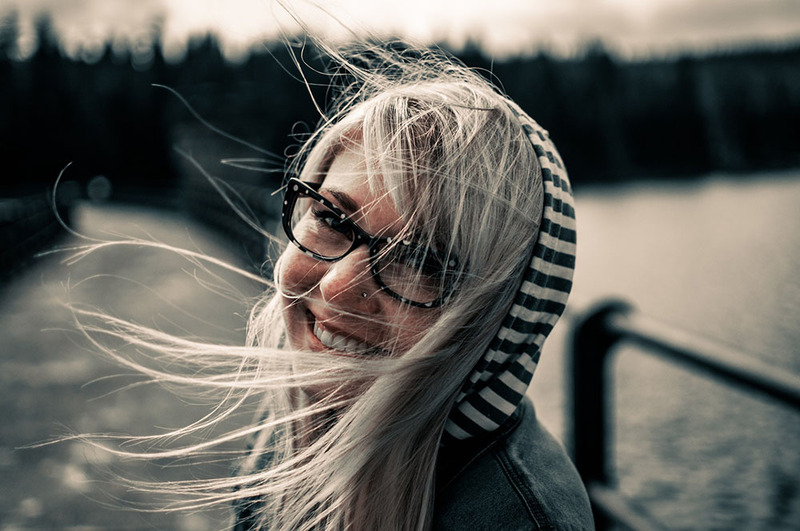 Metal frames usually last longer, particularly stainless steel and titanium, which is nice if you think you’ll want to keep the frames a long time and just get new lenses as needed. Because most metal frames have adjustable nose pads, they work well for people whose noses are too small or large for plastic frames. If you are allergic to certain metals (for example, many people are allergic to nickel), but have your heart set on a metal frame, make sure to get one that’s hypoallergenic. Also, you should take into account the kind of jewelry you like to wear: if you wear a lot of gold, you might not want silver-colored frames, and vice versa. Plastic frames tend to be less expensive and feel lighter on your face. They usually need less maintenance than metal ones, but certain types of plastic contract and expand with temperature changes and require more frequent adjustments. Do you tend to accidentally break things a lot? If so, you might want to look into flexible hinges, which are more indestructible than regular hinges. For example, you can bend the temples (the side “arms”) out more than you can with regular hinges. So, that’s it: five simple steps to fantastic frames. Now, schedule an appointment with your eye doctor, and you’re all set.